Portland, OR (May 9, 2018) The Wheels of Justice (WOJ), the number two roller derby team in the world and the best roller derby team in North America, return from The Big O roller derby tournament in Eugene, Oregon, undefeated with two wins under their belt. 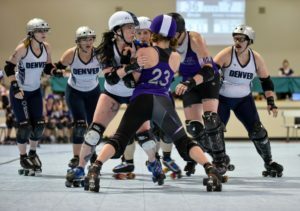 On Friday, WOJ defeated St. Louis’s Arch Rival Roller Derby (ranked #7 in the world) with a score of 240 to 126; on Saturday, WOJ defeated Denver Roller Derby (ranked #5 in the world) by a score of 231-146. These bouts represent the team’s first steps to compete to be the world’s best roller derby team for the third time at the WFTDA Championships, which will take place this November in New Orleans, LA. Despite WOJ’s record and reputation, this tournament was different because—like many of the top-tier teams in the Women’s Flat Track Derby Association—it saw several retirements over the course of the off-season. Given Portland’s reputation as a roller derby powerhouse, though, the team was able to leverage transfers and reach down into the league’s home teams to find new players to fill the gaps on offense and defense. On offense, the strength of WOJ’s jammer corps is all-but-famous in the world of roller derby. At The Big O, seasoned veterans like Loren Mutch, co-captain Nicole “Bonnie Thunders” Williams, Claire “Brute” Chin, and more were joined by new teammates like Jordan “Zip Drive” Veirs. Both Chin and Jubert were selected to represent Portland in the tournament’s MVP Showcase bout. “Bonnie and Mutch have a wealth of experience to share with our jammers and that we work really hard to never underestimate our opponents and to hustle for every point,” says Big-O MVP and RCR Jammer, Claire Chin. The core of WOJ’s defense remains solid in the face of several notable retirements. Co-captain Elicia Nisbet-Smith, Tarandiehl “Tarantula” Baghat, Rochelle “Gal of Fray” Jubert, and Juniper Simonis continue to hold off opposing teams’s offense while enabling Portland’s jammers to score points. “We played OUR game—something that can easily be lost when up against varied opponents,” says Big-O MVP and RCR Blocker, Rochelle Jubert. The next stop for the Wheels of Justice will be its three-day Hometown Throwdown tournament, which will take place at The Hangar at Oaks Amusement Park from June 22-24. New York City’s Gotham Girls, Los Angeles’ Hollywood Scarlets, and Malmö (Sweden)’s Crime City Rollers will be traveling to Portland to compete. You can purchase tickets for the event through the Rose City Rollers’ website. The Wheels of Justice (WOJ) are the premier travel team for Portland, Oregon’s Rose City Rollers. WOJ first made it to the WFTDA Championship bout in 2014, where they lost to New York City’s Gotham Girls. A year later, in Minnesota, they beat the Gotham Girls for their first WFTDA Championship. Then, in front of a home crowd in 2016, they defeated the Gotham Girls for a second time establishing Portland’s place in the world of modern roller derby. The Women’s Flat Track Derby Association is the governing body for women’s flat track roller derby. Over 400 leagues from around the world are members, with another 46 leagues working toward completing the requirements for full membership. WFTDA sanctions tournaments like The Big O and Rose City Rollers’ Hometown Throwdown. Both Arch Rival Roller Derby and Denver Roller derby are both top-10 ranked teams who moved up in the rankings as a result of The Big O tournament, according to Flat Track Stats (a website that is often seen as an authoritative source for roller derby statistics). Following the tournament, Arch Rival is ranked number five in the world, coming in just behind Denver at number four. WOJ’s relationship with Denver is a special one as that two of Denver’s most well-known players, Hillary “Scald Eagle” Buscovick and Erika “Brawn Swanson” Buscovick, previously skated for WOJ. The Rose City Rollers serve women and girls who want to play the team sport of roller derby, connect with an inclusive community, and realize their power both on skates and off. They are a 501(c)(3) nonprofit, formed in 2004, and a founding member of the Women’s Flat Track Derby Association. RCR currently serves more than 500 skaters ages 7-55 and is supported by over 800 volunteers.